New test results by an independent laboratory raise questions about the accuracy of monitoring for airborne contamination at Hanford. A Hanford watchdog group has released independent test results that found Americium-241 in two air filters from cars that had been declared clean of such radioactive contamination. The findings raise questions about the accuracy of earlier test results by an Energy Department contractor charged with monitoring Hanford-site vehicles for contamination. “Even if the radioactive dust particles we’ve found are microscopic, they could still affect people’s health,” said Tom Carpenter, executive director of Hanford Challenge, which contracted with Boston Chemical Data for the new round of tests. The radioactive contamination has spread from a troubled cleanup project at Hanford’s plutonium finishing plant. 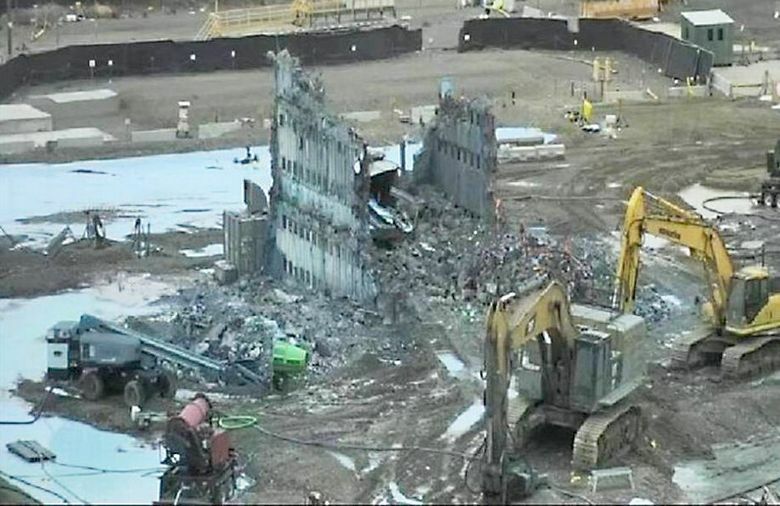 Contamination has been detected by state air monitors as far as 10 miles from the site of the demolition work, which is considered to be one of the most high-risk portions of the cleanup of the Hanford site, where plutonium was produced for atomic bombs. Since December, all demolition at the finishing plant has been put on hold. Meanwhile, workers have applied fixatives to try to keep more radioactive materials from getting whipped up by the wind. Meanwhile, Energy Department officials have posted frequent online briefings about efforts to contain and track the spread of the radioactive contamination. The Energy Department, in a Thursday statement, said contamination levels found by Boston Chemical were below levels considered a risk to workers, the public or the environment. They were also below what could be detected by instruments used by the field technicians who did the earlier round of testing, according to the Energy Department statement. The contamination spread has raised safety concerns among workers, and some are wary of the information released by the Energy Department. Last month, Carpenter said four people who have worked at the demolition project decided to turn over a total of five filters for independent testing. All previously had their cars tested by the Energy Department contractor, which returned the cars after they were cleared as clean. The new testing by Boston Chemical found contamination on filters drawn from two of these workers’ cars. Marco Kaltofen, president of Boston Chemical, said even a small amount of radiation can increase health risks, and it shouldn’t be ending up in a worker’s car. A separate round of Energy Department testing has involved bioassays to determine whether workers have ingested or inhaled minute but detectable amounts of radioactive materials. Last summer, 31 workers tested positive. A second round of testing involves more than 290 workers, and began in December. So far, the results for 242 workers have come back clean. Another 10 workers had “positive verified doses” of a radioactive material,” according to an Energy Department update released Thursday.